Oh yeah, I almost forgot, lol here's a pic of the inside..
Hope you all have a Super day! & thanks so much for dropping in today! Your window card is perfect, Shannon! Love the little owl, you colored him so beautifully! Hugs! Shannon, our owl is the sweetest! He's colored beautifully and I really like how the leaves extend off of the page! Shannon, I just adore that little owl and the way you placed him in the tree! How perfect. Delightful window card and i love the owl paper on the front. Marvelous design, my friend! Your window card turned out great! I love the depth you have with that cute hooter in the tree! NJ! Awesome coloring on that owl. Love the striped papers, too. Shannon, this is awesome! It's totally flawless. Everything about it is just perfect. I haven't done a card like this either - you make it look effortless. Great work friend. What an awesomely adorable card! 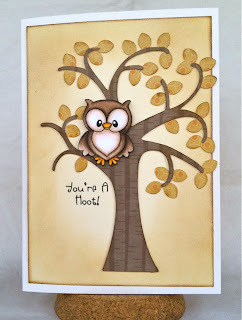 Love this owl and love the design of this card. Oh, my gracious, Shannon! This is absolutely precious! I have such a soft spot, in my heart, for owls, and this one is ever so sweet! LOVE his little, fall tree and that fabulous, owl DSP, too! Just perfect! "Pretty good?" Really? No, this is downright awesome! WOW Shannon this is sooo cute! I love that sweet little owl and your AWESOME tree! This is fabulous!!! This is so sweet Shannon, I love the papers, and your fab colouring, and the inside is lovely too. I absolutely LOVE this!! FABULOUS creation! Ohhh...love how you framed that SWEET owl! Beautiful paper! Inside of card is fab, too! Great job...love it! Nooo, YOU'RE a hoot! LOL - love love LOVE how you created this card. Such darling, unexpected elements, with both the inside and outside of the card being used. Really sweet card, Shannon. As always, gorgeous color choices and shading. Hoot! Hoot!!!! Your window card is wonderful. I must try one sometime. 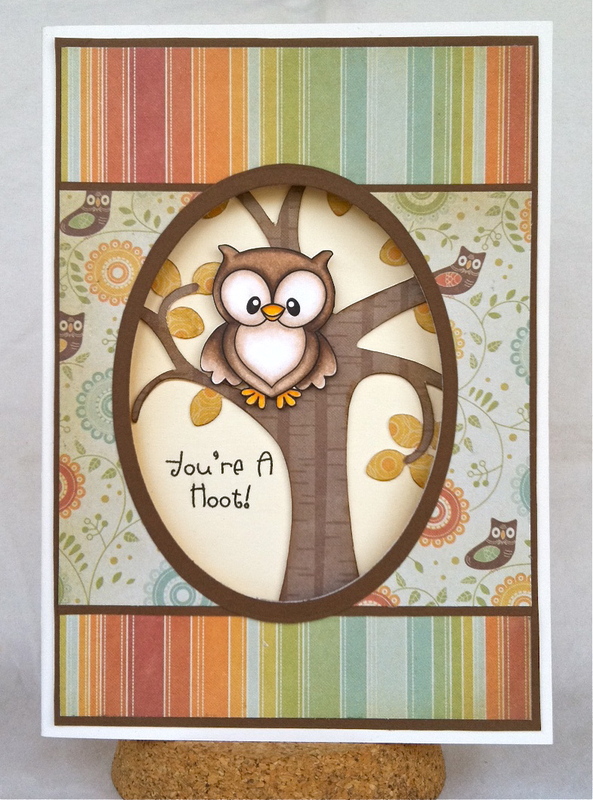 Your design goes this this owl perfectly -- really special card Shannon!! Aww this is very sweet Shannon! I love owls and this one is a real cutie!! Love the tree he is sitting in… and the gorgeous papers - it's a really cute card! Again....awesome coloring!! Great papers, too.